I’m on maternity leave! Yahoo! I somehow created a massive to-do list for myself this week so I’ve been a busy bee already. I’ve discovered that a lot of people don’t work a typical 9-5 (or don’t work at all) because the stores and streets seem to be as busy on the weekdays as on a weekend around here. One big thing on my pre-baby but post-work to-do list is to get our freezer and pantry as stocked as possible with some healthy and/or convenient options for eating during the crazy weeks following Siena’s birth. I’m lucky to have Mike around for the first four weeks so I’m sure if all of this food prep weren’t to get done we wouldn’t starve, but it’s nice to know that we have cheap and homemade healthy meals waiting for us at any time (if the zombie apocalypse happens you know where to go for food). I actually started this process last week by making a double batch of a vegetarian curry I made and putting half of it in the freezer. The crock pot is your friend. You can put all the ingredients of any crock pot recipe (except broth/water) into a freezer safe plastic bag in advance. The night before you plan to make the meal, move the freezer bag into the fridge and the next day drop it all into the crock pot along with your liquids and by dinner you’ll have a meal. It’s not the quickest process but it requires little labor once the prep is done. Get some good freezer safe AND oven safe glass tupperware. Although you need to fully defrost the dish before putting it in the oven, this means one less dish to wash. Trader Joe’s is also your friend. They have a great assortment of healthy, sometimes organic, frozen meals when you’re in a time crunch. I’m not a big pre-packaged meal person (usually there’s a ton of sodium and added unnecessary ingredients), but Trader Joe’s seems to keep things pretty clean (most of the time – be sure to check labels if you’re worried about sodium content or added soy/corn fillers). Make your own frozen brown rice. Packaged frozen brown rice is a rip off! We buy a 12 pound bag of organic brown rice from Costco which make rice incredibly cheap. Freezing it yourself is really easy and way cheaper than the pre-packaged frozen varieties. Give yourself time. Ideally, you’ll start this process at least a couple weeks before baby is set to arrive. Start doubling recipes you’re already using for dinners and freezing some. Make brown rice while you’re watching TV at night. 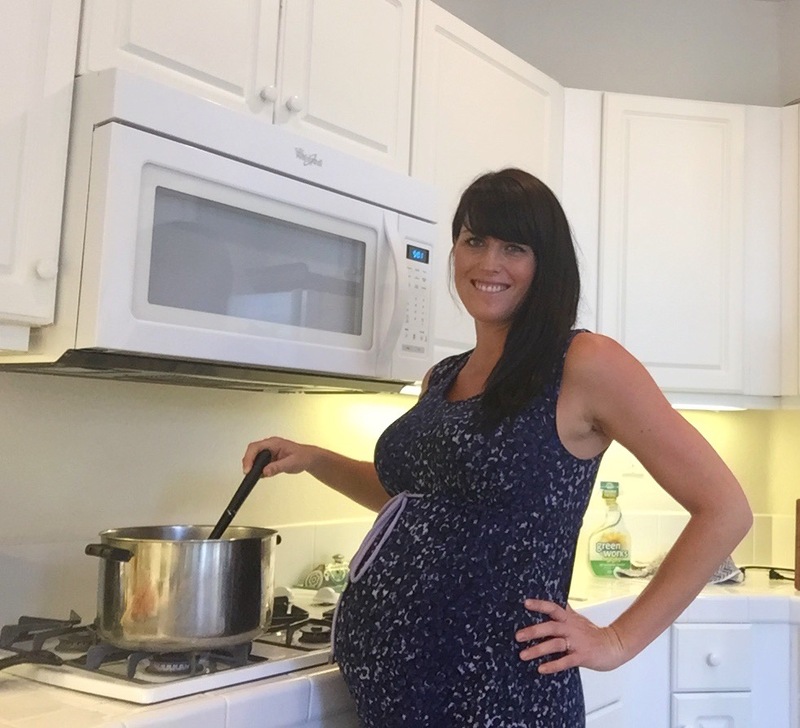 The project will seem way less daunting this way and it also means that you’re not buying all the groceries at once with the risk of going into labor and having most of them go bad by the time you get the energy to cook again. 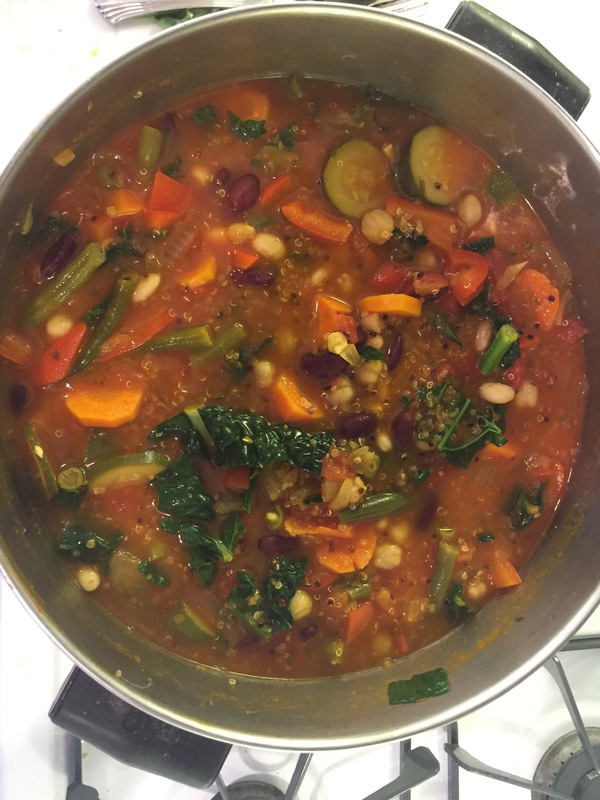 Quinoa Kale Minestrone – I cooked this yesterday afternoon and froze the leftovers. I added an extra bell pepper, an extra 1/4 cup of quinoa, a can of kidney beans and a 2nd veggie broth to make it even more filling. Lentil Spinach Cashew Curry – I actually made this one for dinner this week but tripled the usual recipe and then froze over half of it. Black Bean Yam Chili – I didn’t actually cook this one – just put all the ingredients except the water into the freezer safe ziplock. Sweet Potato, Zucchini and Chickpea Curry – I actually made this as a meal last week and just doubled the recipe and froze the leftovers. 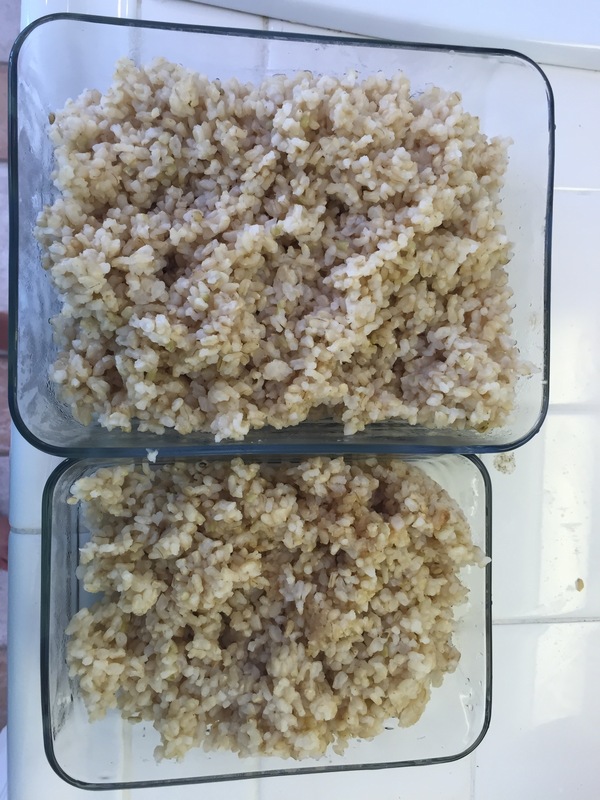 Frozen Brown Rice – I made about 6 cups of brown rice in the rice cooker, let it cool and put it in freezer safe containers to go with the above curries. I considered packaging it in 1 or 2 cup portions in freezer bags but ended up just using glass tupperware since I figured we’d defrost it at the same time as the lentil and sweet potato curries. Costco Frozen Lasagna – Although they don’t have a vegetarian version, I still bought this since we do eat meat at least once a week. 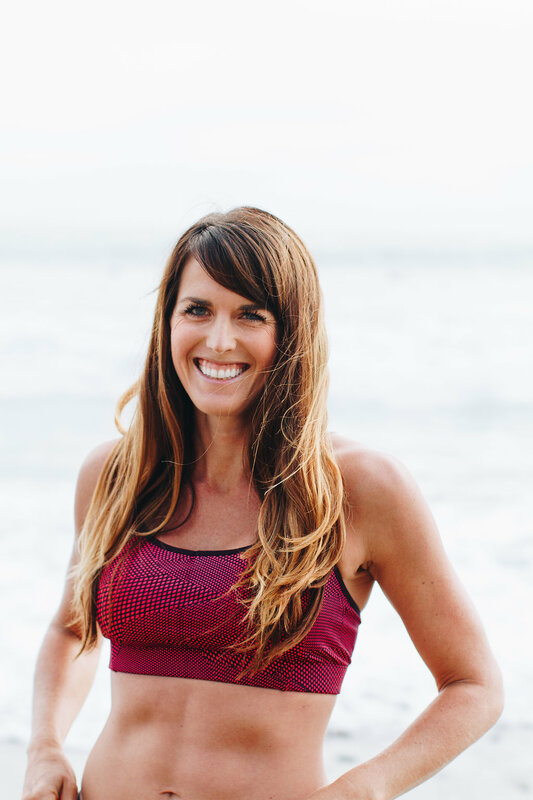 We ate a lot of this back during training for the Ironman – we’d put it in the oven and hop on the bike trainers for an hour or more ride and have a calorie dense meal by the time we were out of the shower! And since it’s a family sized portion, there are leftovers for at least 1-2 more meals (maybe more if you don’t have Ironman or breast-feeding induced hunger). 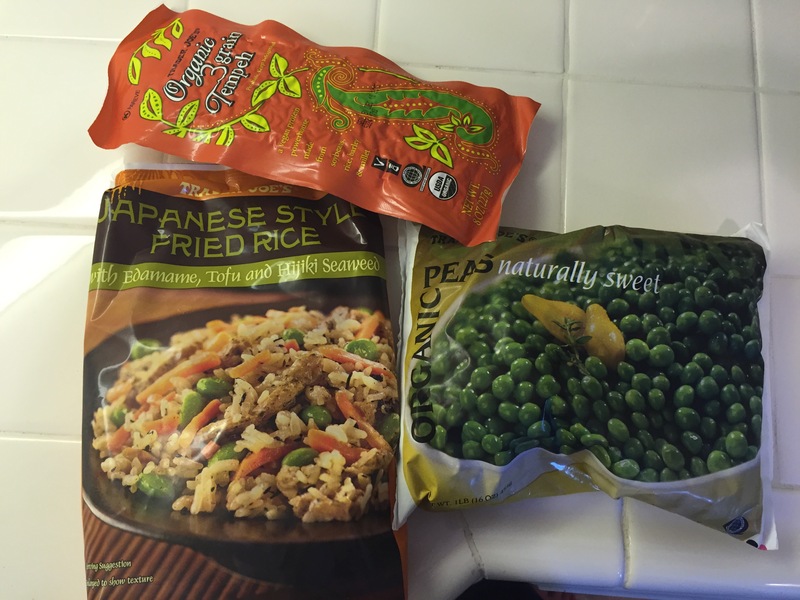 Trader Joe’s Japanese Style Fried Rice, Tempeh and Peas – This meal has become one of my go-to easy weeknight meals. I sauté the tempeh with soy sauce first, then add in the fried rice and peas (also edamame if I have it). I usually steam broccoli and serve it on top as well (a fried egg would be good too!). Tempeh lasts quite a while in the fridge (about 3 months) so I’m not worried about it going bad before baby comes. Nut Tacos – We discovered these little gems a few years ago after tasting a sample at Whole Foods. These convenient little tacos already include the shell and are filled with non-soy based vegan filling. I just add some avocado and salsa to them and serve with a veggie side and it’s an easy meal I can make in 15 minutes! Black Bean Burgers – With about 20g of protein in one 200 calorie patty, these are great even as a snack on their own but also easily served with a microwaved sweet potato with coconut oil and cinnamon on top (baked if you’ve got time) and a side of veggies. Amy’s Organic Lentil Soup (Costco) – Great for snacks or a with a salad or sandwich at lunch. Organic Bread & Peanut Butter – Just freeze the bread and it stays fresh for well over a month (or longer) and you can’t go wrong with peanut butter! I’m hopeful that all this meal prep means that we won’t be eating pizza every night after Siena arrives (although I do love pizza – if you order one for us, I won’t turn it down!). What is your favorite meal as leftovers? 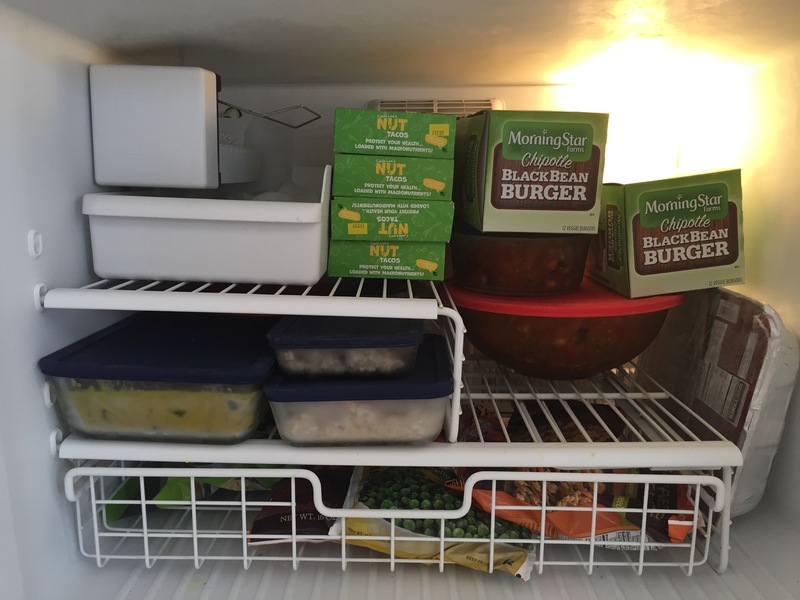 Do you ever freeze food for future enjoyment? I kinda wish I would have done something like this before Axel arrived. We had family and friends cooking/bringing us meals for the first couple weeks, but now we are on our own. I find that when Justin is not around, I really struggle to eat because everything takes time to prep (and time is what I don’t have). That’s funny that you mentioned the Costco lasagna. When friends would drop by and bring us dinner, lasagna seemed to be the meal of choice. We were eating lasagna for days (which I did not find one bit). You guys are definitely set! Now, time to deliver that baby!!! I just had someone tell me how they don’t get how anyone could keep pregnancy weight on bc of how hard it is to find time to eat post baby…. Hah I’m not sure how I feel about that comment but it seems to be pretty consistent that new moms struggle to feed themselves! We did this too! Lots of eggplant parm & kale & tortellini soup! Kale and tortellini soup sounds yummy! Send me the recipe! Perfect timing on this post for me! I was just writing last night how I want to start planning/making some freezer meals to have on hand once Baby #2 arrives. The quinoa & kale minestrone looks delicious. Whoa mama you are ready! I did no such cooking or preparing before I had my twins almost 7 years ago! Of course we ended up eating a lot of take out because of it, so I think you are amazing! I always make big meals so that leftovers are used for lunches and/or put in the freezer for a dinner in a pinch. I want to try chopping and prepping meals to put in the freezer that just need to pulled out of and tossed in the crockpot. These definitely sound like some tasty recipes and smart of you to do the prep! I made veggie lasagna and turkey meatballs as well as oat/date/PB power balls for post baby life and I picked up a few quarts of soup from a local soup place to have on hand. It was definitely nice to have during those first few weeks when we just wanted some warm, hearty meals without much effort. I’m in the final stretch of my pregnancy too (37 weeks) and also trying to stock our freezer with my time off. Fyi: make things that can be held with one hand.. I keep hearing that it’s hard to eat a bowl of soup/spaghetti with a baby hanging off your shoulder! Calzones and burritos are going to be my life savers. 🙂 Good luck with everything!